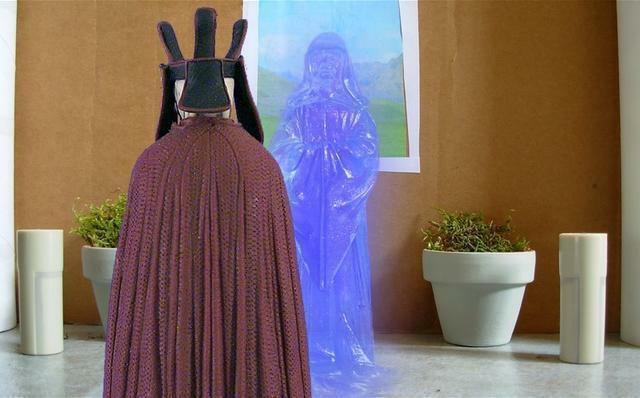 After their short negotiations with Trade Federation Viceroy Nute Gunray, Jedi Master Qui-Gon Jinn and his Apprentice, Obi-Wan Kenobi, had rescued Queen Amidala of Naboo, which had been invaded by the Trade Federation. 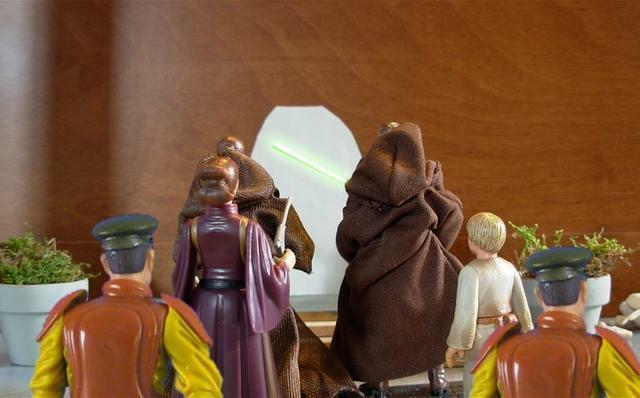 They then were going to take the Queen to Coruscant so she could plead her case to the Senate, but the trip required a slight stop-over on Tatooine, where they met a nine-year-old boy named Anakin Skywalker. 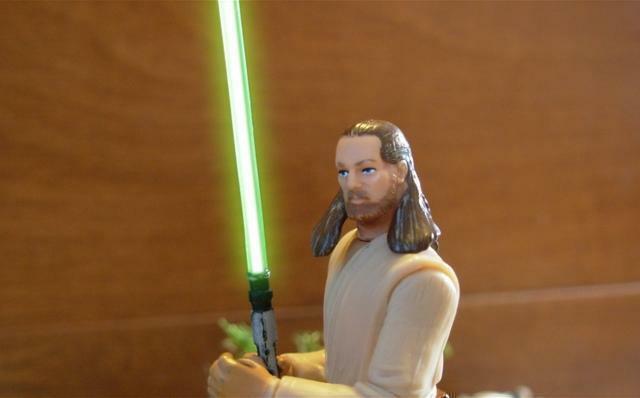 Qui-Gon saw that the Force was with Anakin. 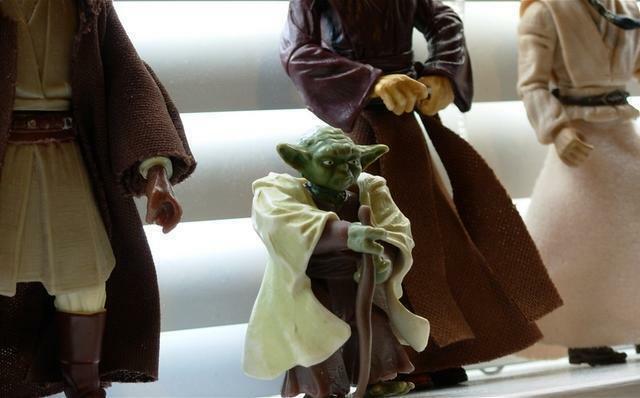 When he had done ‘medical’ testings on Anakin, he had seen that Anakin was more powerful than any Jedi, even the great Jedi Master Yoda. 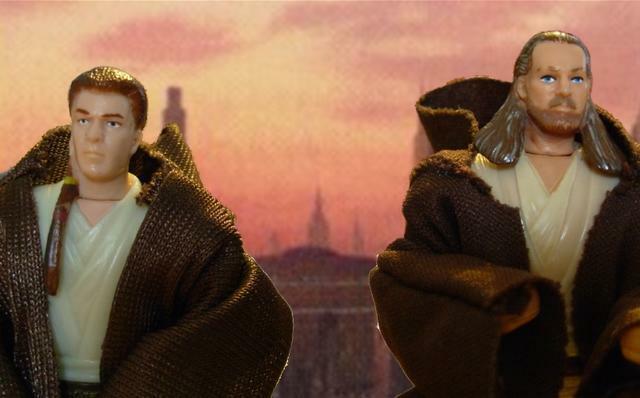 When Qui-Gon and Obi-Wan continued the trip to Coruscant, they had included Anakin. 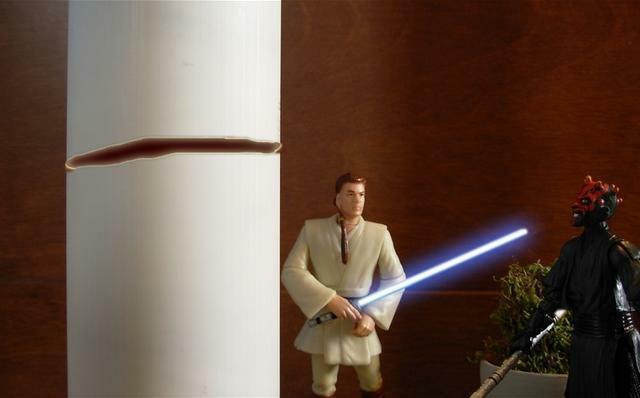 Qui-Gon wanted him to be trained to be a Jedi; on Coruscant was the Jedi Temple, where he should be tested, and if he was accepted, he would become a Jedi. 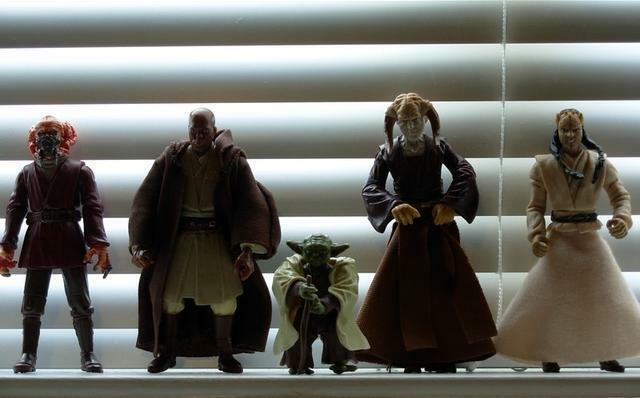 And here he was with Obi-Wan in front of twelve great Jedi Masters, a group called the Jedi Council which in one voice made the decisions for the Jedi Order. 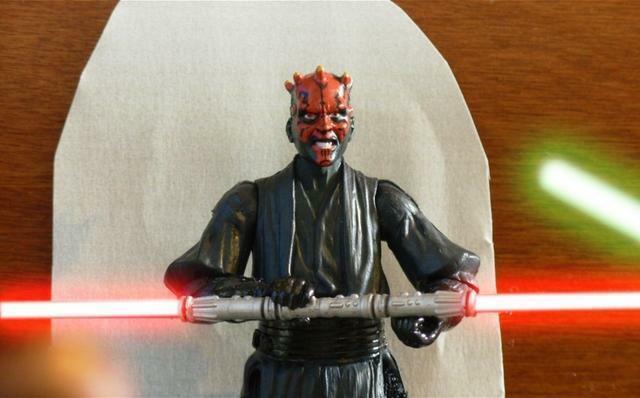 With astonished glares, the Jedi Council ordered him to bring him before them. 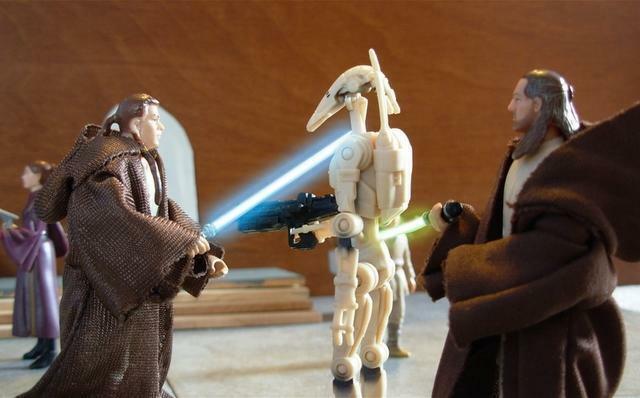 Young Anakin Skywalker stood before the twleve Jedi, being tested. 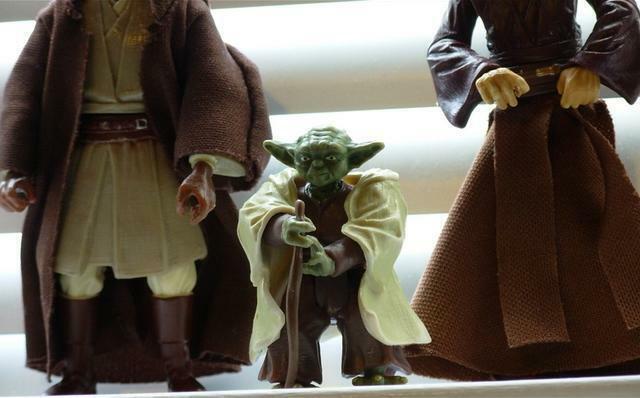 “Afraid, are you?” Yoda asked. 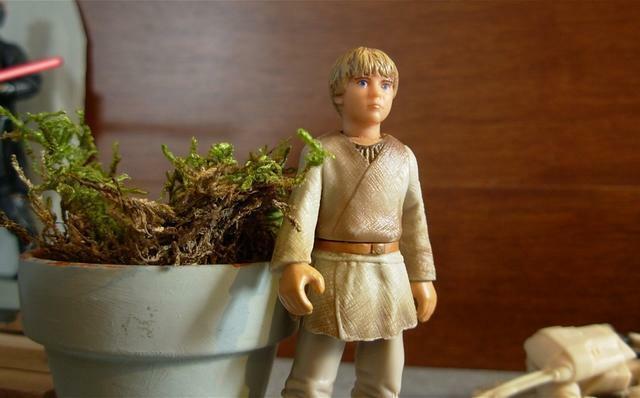 “I miss her…” Anakin had to be split up from his mother, Shmi Skywalker, when taken from Tatooine to Coruscant. 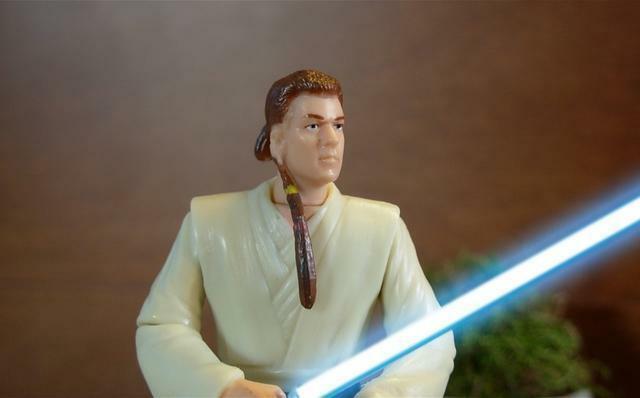 “I am not afraid,” Anakin growled angrily. 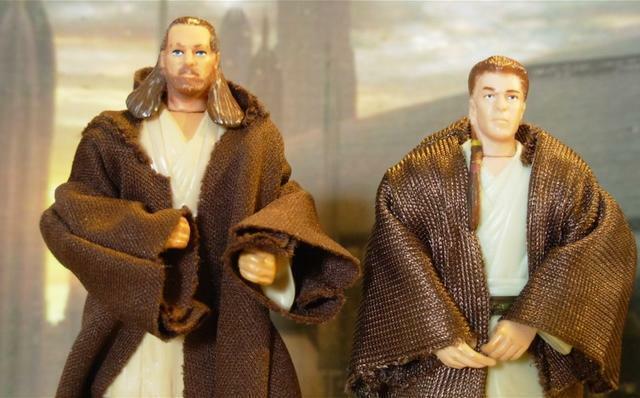 Qui-Gon and Obi-Wan waited outside to hear a result of the test. 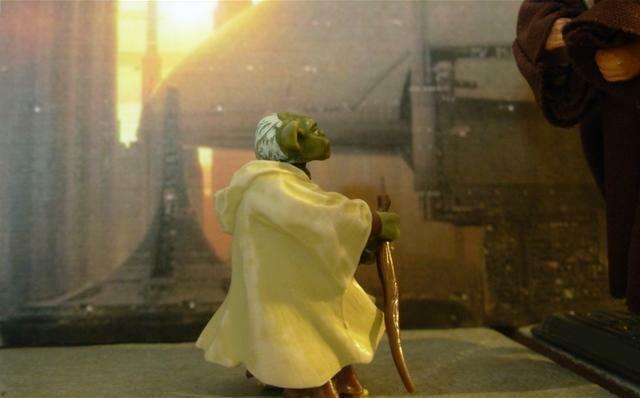 Yoda later appeared, bringing news of the Council’s decision. 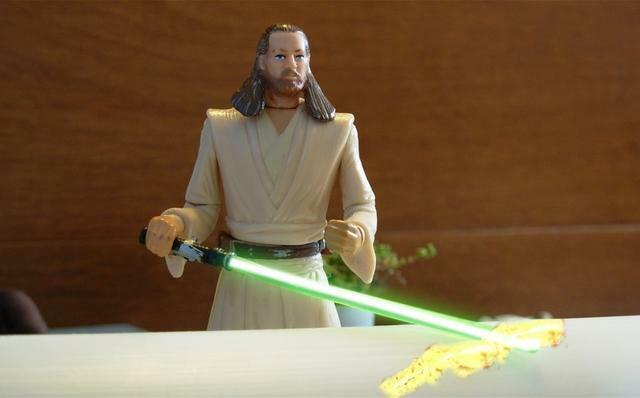 “He’s to be trained, then?” Qui-Gon asked. 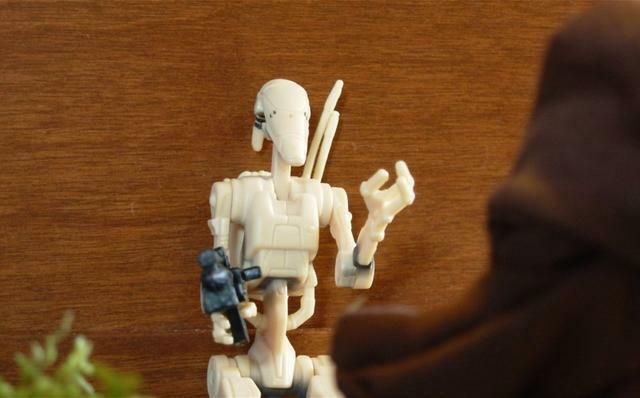 “No? 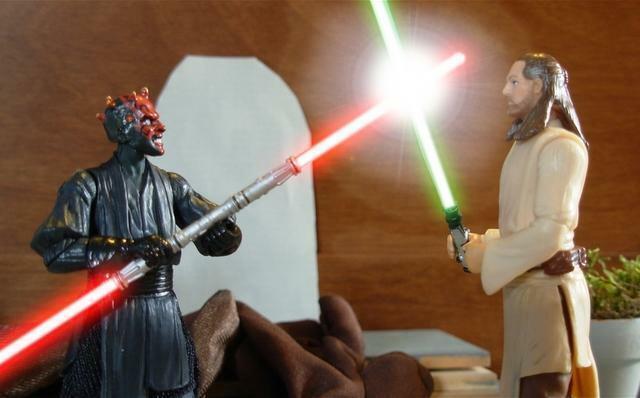 !” It was evident in Qui-Gon’s tone that he was either angry or surprised. 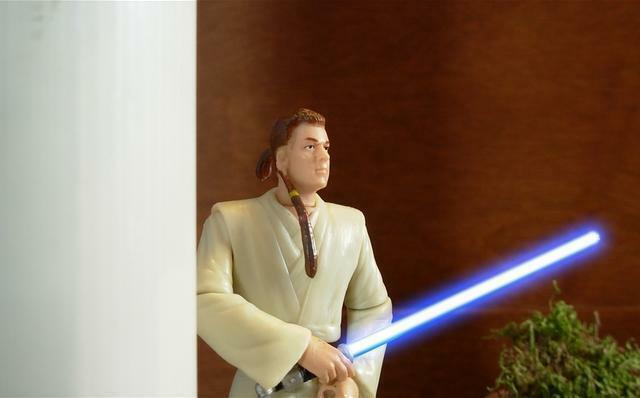 Though angry with the Council’s decision about Anakin, Qui-Gon obeyed and left for Naboo. 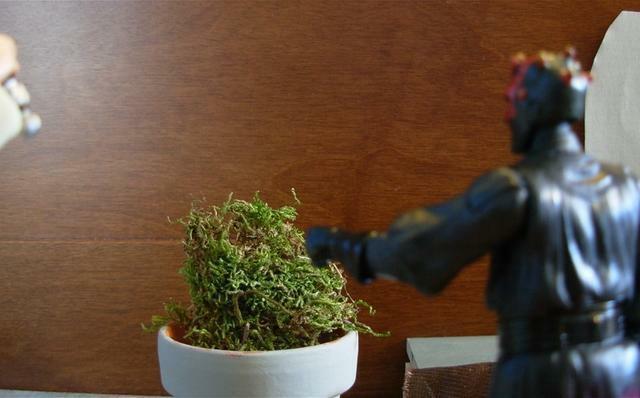 However, he was allowed to bring along Anakin. 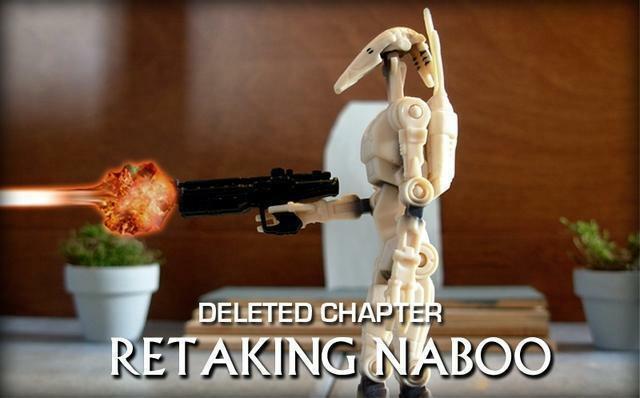 Under control of the Trade Federation, Theed Palace was in chaos. 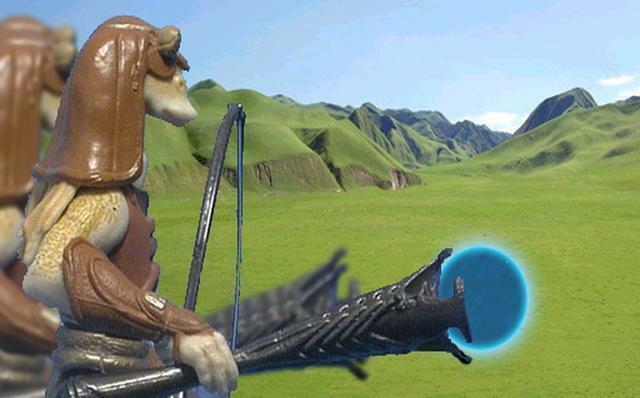 Nute Gunray had once again contacted the Dark Lord of the Sith with information of Queen Amidala’s planned assault to retake the Palace. 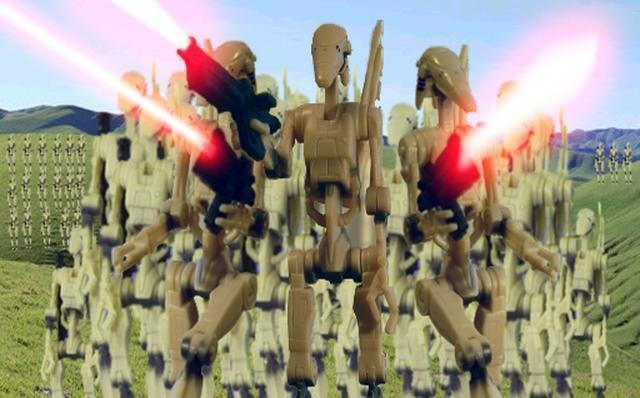 …but they knew they were impossibly outnumbered as thousands of battle droids poured out from transport ships. 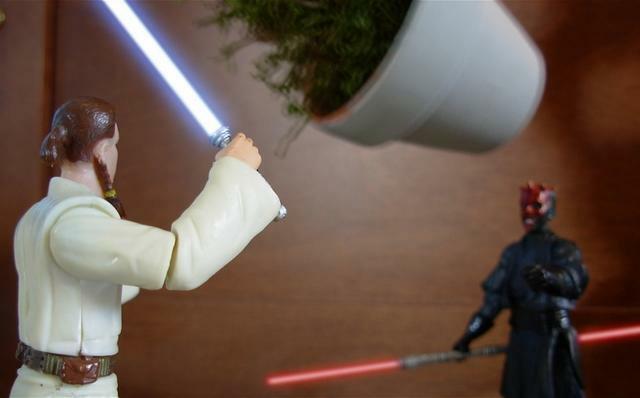 A great battle erupted when two Jedi Knights arrived escorting the Queen. 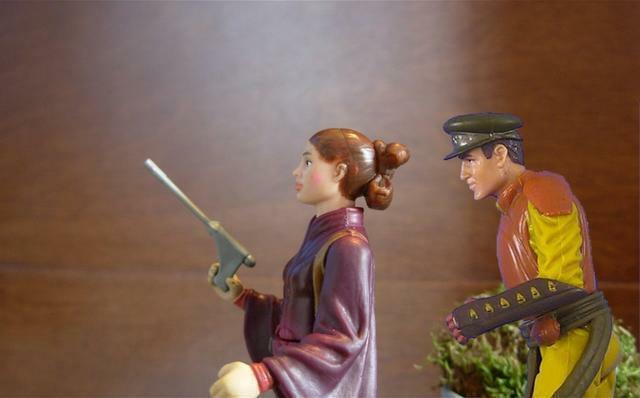 Queen Amidala and several soldiers opened fire on a group of battle droids. 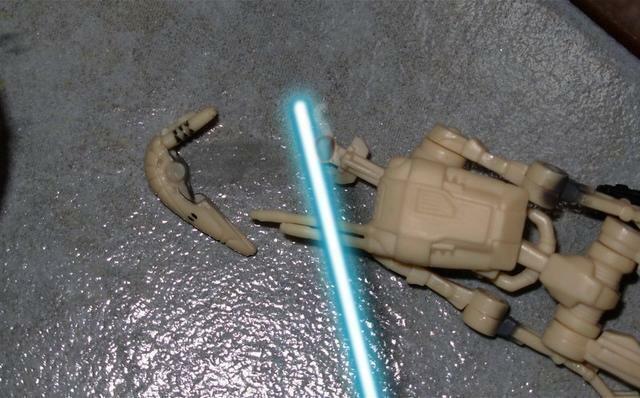 …with Obi-Wan Kenobi’s blade coming from straight behind him, crashing down on the droid’s neck joint! 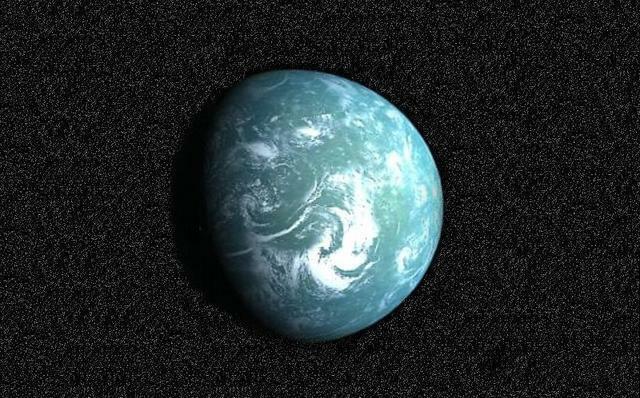 The group marched toward the door to a shortcut that led to the Throne Room, where Trade Federation Viceroy Nute Gunray was located. 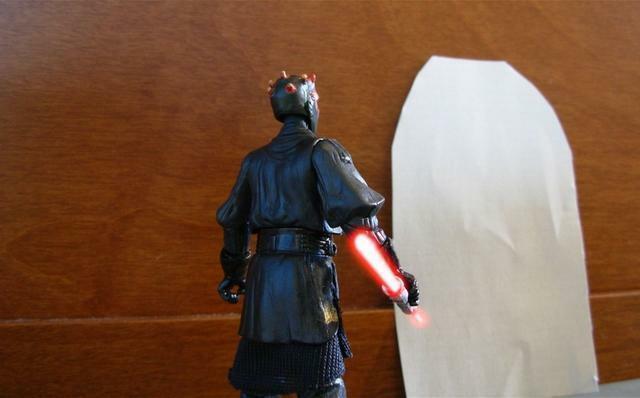 But blocking the door, a new threat appeared: Darth Maul, Darth Sidious’ Sith apprentice! 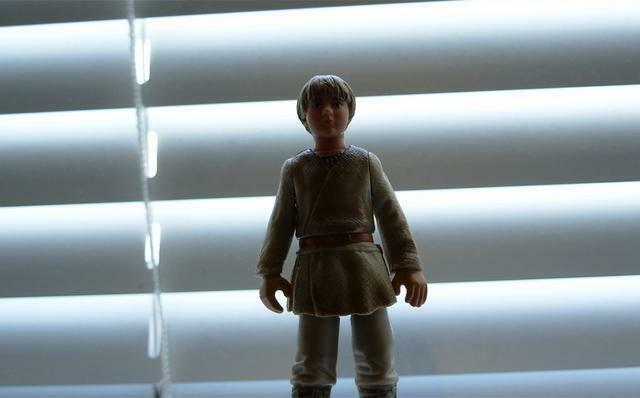 The young Anakin Skywalker went off to pilot a starfighter in the hanger. 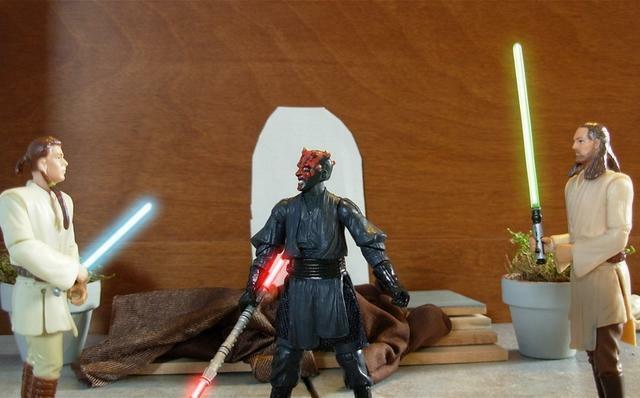 And that left the two Jedi to deal with Darth Maul! 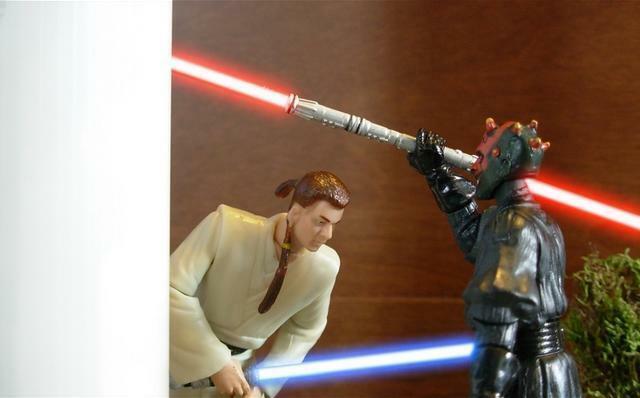 Obi-Wan went to hide behind a pole, waiting for the right opportunity to attack. 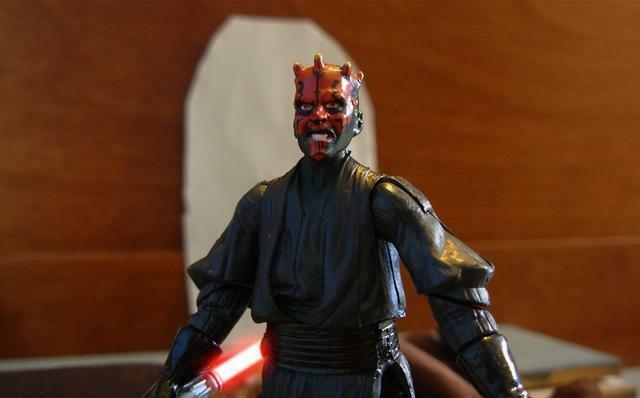 But instead, Darth Maul went after him right away, and nearly slashed his head off! 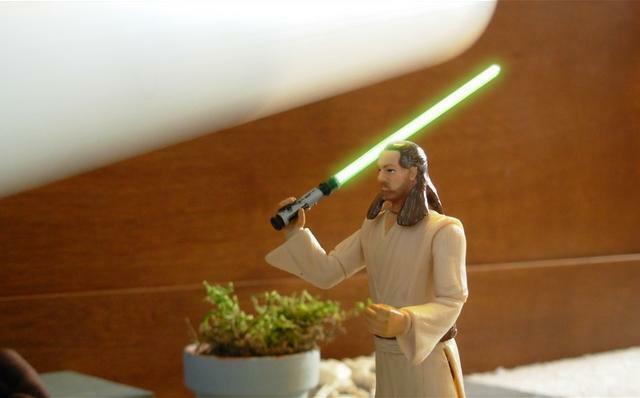 …and the broken half was flying straight toward Qui-Gon! 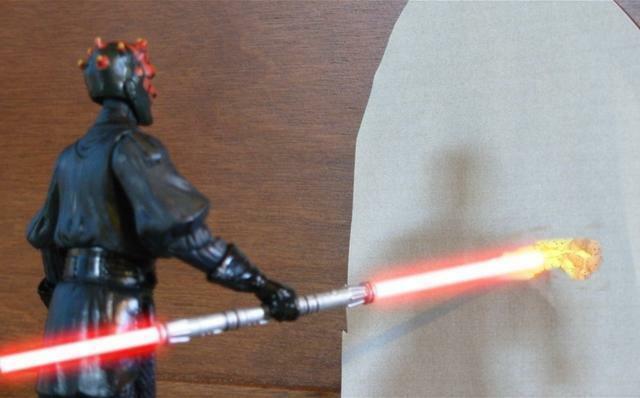 Fortunately, he just barely was able to cut the already-slashed pole into another half. 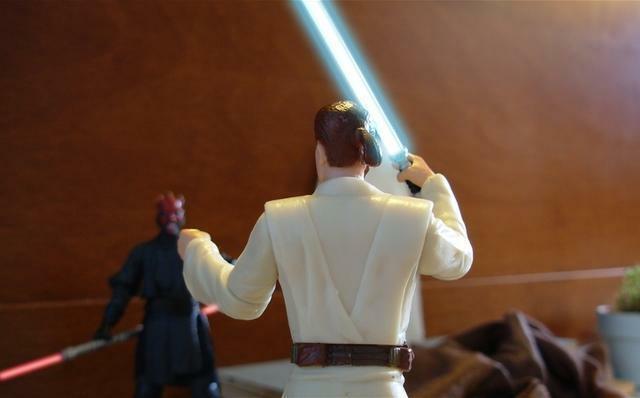 The two Jedi closed in on Maul. …and hurled it towards Obi-Wan! 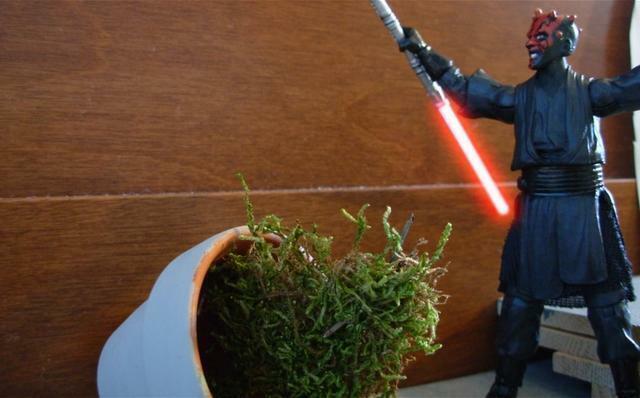 While the pot was still in the air, coming towards him, Obi-Wan sent it back to the Sith. 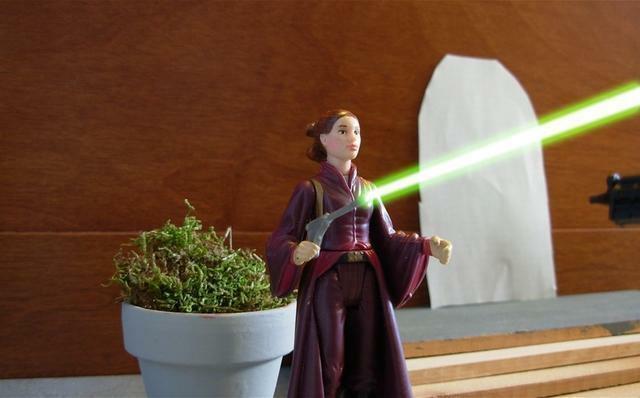 …trying to lure the Jedi into a battle which would be their doom.